CSI practitioners know all too well that partnering with government is essential for sustaining and scaling development initiatives. 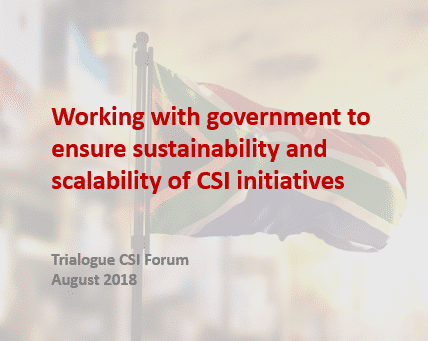 The August Trialogue CSI forums discussed approaches and strategies for working with government and explored the benefits and challenges of public-private partnerships. Estimated CSI expenditure in 2017 was R9.1 billion – amounting to less than 1% of government’s R1.5 trillion national budget for social services, for the same period. 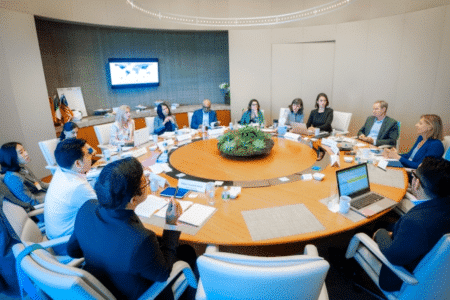 While companies can by no means displace government’s provision of essential services, it is imperative that the two sectors find ways to work together to ensure that maximum social impact is attained. Simply paying for what government would have paid for is not an efficient use of resources. Companies can contribute to enhancing developmental impact beyond their CSI work, by drawing on their core business expertise to influence and innovate. • Piloting innovative projects and proving that they are effective and scalable. In this case, companies don’t need to be the delivery agency but can provide the investment in pilot projects and be at the forefront of initiating innovation. For example, Hollard Foundation worked with government to show that the law allows municipalities to support non-centre based early childhood development (ECD) services. Through the pilot, Hollard has developed standards for non-centre based ECD which are being adopted by national government. Historically, there has been distrust between business and government and, on some level, this wariness continues. Head of transformation and corporate affairs at Woolworths, Zinzi Mgolodela, detailed some of the characteristics of the broad relationship between the two sectors and provided insight into how companies could overcome some of the stumbling blocks towards meaningful relationship-building. She explained that the discussion around shareholder interest versus public interest comes into focus very often, with government not yet fully acknowledging that business is increasingly prioritising the stake that the public has in its operations and success. Generally, government is viewed as the policy and lawmaker, while business is perceived as only being profit-driven. It is important for a company that wants to engage government to have a clear understanding of its own developmental agenda and holistic strategy (through its CSI, as well as its core business), in order to shift government’s perspective of the company’s role – and potential – within society, and to strengthen the company’s credibility with government, over time. In addition to understanding the developmental purpose of the business in its entirety, Mgolodela also spoke to the importance of having a good grasp of the mechanisms and structure of government, so that relationships are developed with relevant government departments and representatives. • At a basic level, there is strong commitment to corporate compliance with South African laws and regulations. This establishes a sound foundation on which to establish a more meaningful relationship. • By sharing developmental insights and lessons with the retail industry, as well as with government, investing in research and piloting projects to test for scalability, the company serves as a thought leader. This role takes time to develop; it is an earned ‘seat at the table’. • Similarly, being an influencer in the industry earns the company the right to also influence government. • The company sometimes serves as an associate of government, often through an unstructured and negotiated relationship that depends on the specific needs of a project. • Partnerships are more structured and direct relationships with government and demand more careful management of expectations on both sides. Santam’s CSI manager, Tersia Mdunge, shared how Santam is partnering with municipal government to build resilient communities. In 2011, government, through the Department of Cooperative Governance and Traditional Affairs (COGTA), invited companies to partner with municipalities to build capacity for service delivery as part of the Business Adopt a Municipality (BAAM) programme. The assumption was that companies have key resources and skills that municipalities could leverage in a partnership. Santam adopted five municipalities but had no concrete strategy for how the programme would work. However, Santam learned a lot from working with the municipalities, particularly how exposed they were as an insurer. Many of the municipalities lacked fire chiefs, general firefighting capabilities, and fire prevention equipment (e.g. smoke alarms in children’s homes, old age homes, etc). They therefore realised that the partnership could be a meaningful CSI initiative with a shared value approach. Santam now has MOUs in place with COGTA and the South African Local Government Association in order to formalise the programme. Given the mandate of municipalities to manage disasters, and the mandate of insurance companies like Santam to take liability for the damage caused by such disasters, such a partnership makes business sense. 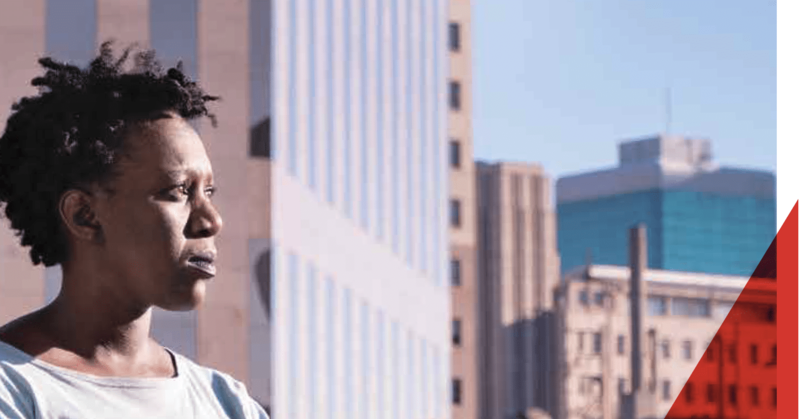 Santam therefore rebranded the BAAM programme as the Partnership for Risk and Resilience to signal that the relationship was not one of patronage, but one of mutual benefit. Santam’s current approach is to identify municipalities that are vulnerable using annual data published by the National Disaster Management Centre, together with municipalities that are considered high risk by its internal analysts through the review of claims ratios. Through this approach, four district municipalities were identified for partnership: Sedibeng District in Gauteng, Ehlanzeni District Municipality in Mpumalanga, the Sarah Baartman District Municipality in the Eastern Cape, and the Thabo Mofutsanyana District Municipality in the Free State. The programme has five focus areas that centre around disaster risk management for floods and fires in particular. They are directly informed by the National Disaster Management Act. Santam provides support with disaster management plans, early warning systems, payment for training of fire fighters, updated GIS training, and firefighting and general disaster management equipment. In addition, they partner with various NPOs to assist with disaster management – for example, they work with South African Red Cross to help deliver recovery response. • Government sometimes has the resources but not the budgeting ability to maximise these. Skilled volunteerism may be considered to build municipal capacity in this area. • The financial systems and controls of municipalities are often not up to standard to account for money provided by a corporate. • Municipal employees often move to the private sector once they are trained (e.g. GIS experts). • Measuring impact is difficult – for example, Santam has provided early warning systems, smoke alarms, etc. Impact may only be measured years down the line, if the early warning systems have prevented a disaster from taking place (e.g. a smoke alarm warning prevented a fire in an old age home). ● Work in the areas in which your company has expertise – Santam is skilled in risk management and prevention. ● Work within existing legislation: The Disaster Risk Management Act makes provision for a municipal advisory board – Santam is now part of this board. ● Align with municipal, district and national plans. Engage the government entity first to understand what they really need, and then align your company’s support to the existing plan. For example: Check the Integrated Development Plan of the municipality to see what projects are planned. The mining industry, for example, has a more holistic planning approach and collaboratively identifies projects with the municipality, other mines and key community stakeholders in the various mining areas. Santam works with the existing disaster management plan of the municipality, rather than trying to create a plan from scratch with the approvals and decisions that would be required to embark on a new document. ● Spend time understanding how the department or municipality that you will be working with functions – how decisions are made, by whom and at what point. Be cognisant of the political cycle, and the various parties’ policies and positions on key issues. ● Be very patient, the Hollard Foundation waited over one year for City of Joburg sign off on a proposed project. ● Government can become dependent on the company after they have been provided with assistance for a lengthy period. Therefore, ensure that you have an exit plan from the outset, and involve government stakeholders in designing this plan, and outlining their role going forward. Ensure that you communicate continuously and manage expectations throughout the programme. ● Government often has the impression that corporates have lots of money to spend on community infrastructure. There is therefore an expectation that corporates should be responsible for building roads, schools, etc. Corporates therefore need to educate government on how corporate budgeting processes work, and manage their expectations. ● An MOU is required to guide the relationship between the corporate and the government entity. This should also outline an implementation plan with timelines and specific deliverables from each partner (KPIs, targets, etc.) and roles and responsibilities. ● Consider partnering with universities whose mandate is research. This would enable corporates to study trends, conduct feasibility studies, etc. ● Reconsider the duration of ‘sustainable’ projects. Exxaro working with World Vision in Limpopo and they only consider projects sustainable after 15 years of involvement.